When I got my first Siberian Husky, back in 1985, Huskies weren't very common. This was long before movies like Snow Dogs and Eight Below made them as popular as they are today. Now Ivan and I pass Huskies on our walks several times a week. 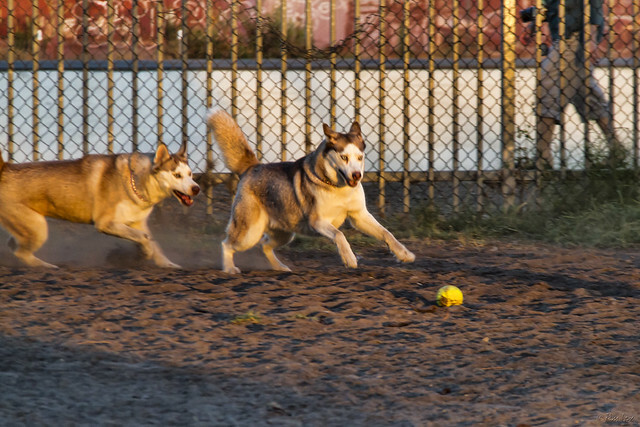 And last week at Downey's David R. Gafin Dog Park (at Rio San Gabriel Park), the Huskies easily outnumbered all the other large dogs put together. I didn't know anything about Huskies back in 1985. I lucked out in that I fell in love with all their qualities, the good and the bad. They're smart, but they're inclined to use their intelligence to suit their own purposes. They are born to run, which is great if they're pulling you on your bike or skateboard (not me! ), but not so great when they escape out the front door. They have a high prey drive ("Squirrel! "), so they'll chase anything, but they're not good at bringing anything back again. They aren't smelly, but they shed their entire coat two (or more) times a year. I wouldn't trade Ivan for anything!